Vitrail : Deep blue 10, Turquoise 17, Greengold 22, Chartreuse 18, Emerald 13, Violet 25, Red violet 19.
auxiliary products : Gold cerne relief outliner, Ceramic/Vitrail thinner to clean your brush. brush : Iris round °4. Carefully degrease the candy dish with soapy water or alcohol. Using a felt pen, draw on a paper a regular seedling of rice grains. Cut out the paper and slip it inside the candy dish and use adhesive tape to maintain it if necessary. With the tube of Gold Cerne Relief, reproduce by transparency the outlines of the rice grains. Make sure to close each design to avoid the colour from running. Allow to dry for 3 hours. Fill in the designs by alternating the different colours. Delicately lay down , using the tip of the brush, a drop of colour inside each section already outlined. Pebeo art materials on line Discounts and Special offers. colours: transparent, intense and very bright. Solvent based, ready to use and can be mixed together. Good light solidity. thinner: mineral spirit or white-spirit. cleaning the brushes: mineral spirit or white- spirit. Pebeo's Vitrail is applied with a brush to all carefully degreased transparent surfaces : glass, acetate, polyester, plexiglas and also on metal and engraving metal. The 26 "antique" Vitrail colours are dense and very transparent. The decorated surface has good hardness and resists to gentle washing with cold water. To imitate stained glass, use with Pebeo's Cernes Relief outliners. They are applied directly from the tube with nozzle before applying the Vitrail colours. The Vitrail colours may also be used with bowl technique. Objects decorated with Vitrail colours are intended for decorative purposes only and should not be considered for practical usage. The Iris brushes are suitable for the application of these paints. Always clean your brushes delicately using the Ceramic/Vitrail thinner, then rinse them in soapy water. 26 Vitrail colours in 45ml and 16 in 250ml bottle. 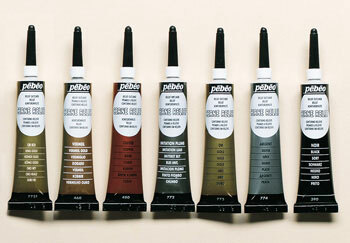 7 Cerne Relief outliner colours in 20ml tube with nozzle. 3 medium in 45ml and 250ml bottle . 1 adhesive 10metre lead tape. 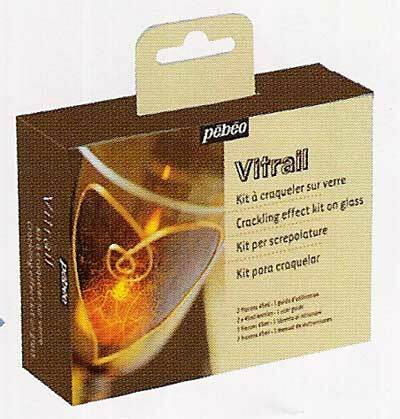 Vitrail and Relief outliner colours are also available in cases and assortments. Gently degrease the surface to be painted with soapy water or alcohol. Once the Cerne Relief outliner has been applied, how much time must elapse before the Vitrail colours can be used ? It is suggested to wait at least 30 minutes for the Cernes Relief outliners to dry, before applying the Vitrail colours. How to prevent the colours from dripping ? On a rounded object, work on the horizontal section. Allow it to dry a few minutes, turn the object and then start over. How can I correct an error ? If the colour is still wet, use a cotton swab, soak in the odourless mineral spirit, to remove the Vitrail colours and simply use water to erase the Cernes Relief outliners. How to get a straight line with the Cerne Relief outliner ? Before starting, always wipe off the excess paint that comes out of the tube. 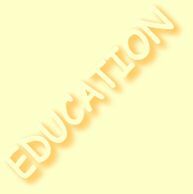 When applying it, use the tube as if it was a pencil and make sure to exert a constant pressure. How to lighten the Vitrail colours ? Use the Vitrail medium lightening : it allows to lighten the colours without changing their qualities or liquidifying them. Where to let dry the work ? The object must be kept, preferably out of dust and in a dry room, during the 6 to 8 hours needed to dry. 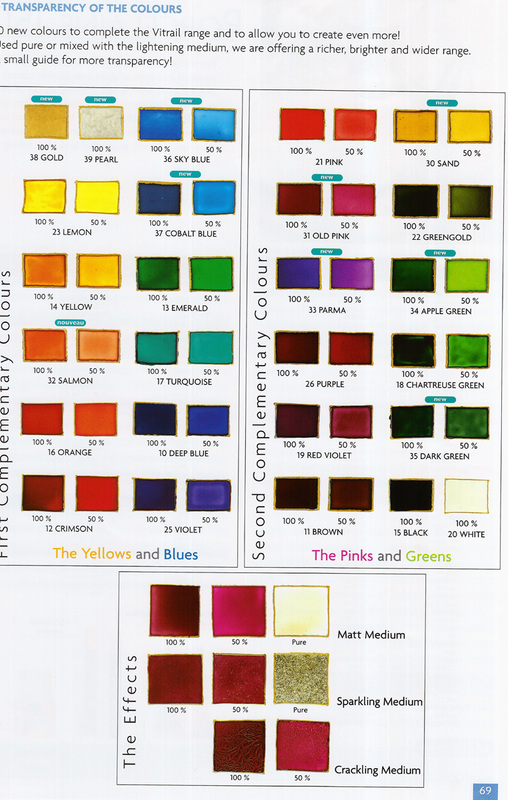 With which other products can the Vitrail colours be used ? 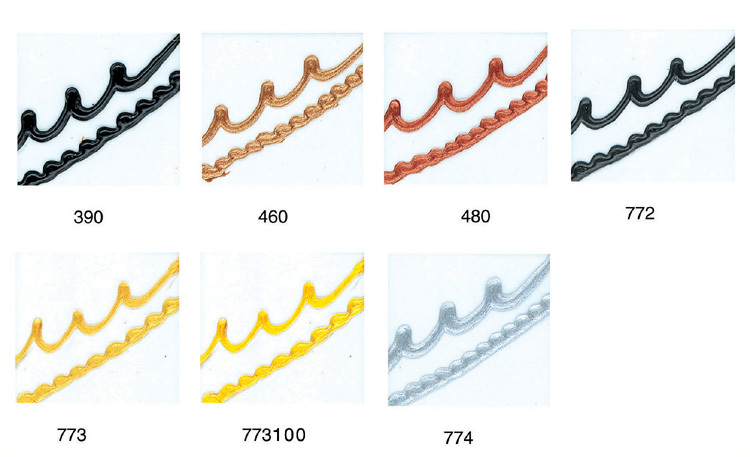 To obtain transparent and opaque effects, use jointly the Vitrail colours and Cernes Reliefs outliners with the Ceramic colours. What is the bowl technique ? This simple technique will allow you to realize marbling effects. Poor a few drops of different Vitrail colours in a bowl full of water. The drops fuse when in contact with the water and give beautiful effects. Then, transfer the colour by applying an acetate sheet or any other object on the surface of the water. As soon as the colour is transferred on the surface, pull it out immediately. Once dry, must the object be baked ? No, of course not ! The Vitrail colours must not be baked. Once dry, they are durable and resist to a light washing in cold water without soaking, as well as to window cleaner. Can we eat out of objects decorated with Vitrail ? No. These colours are intended for decorative purposes. How to fluidity the paint if it seems to thick ? Add some odourless mineral spirit and stir. The design for this frame is simple yet very effective. 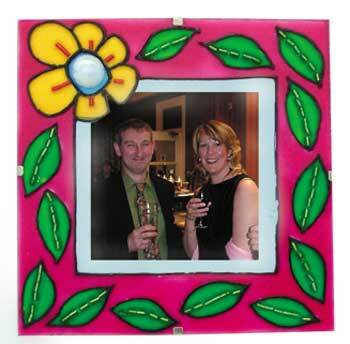 Use the attached flower and leaf templates to design your own painted frame! 1. Trace the outline of your frame onto a piece of scrap paper. Now mark on the area you wish to display your photograph. 2. Cut out both the flower and leaf templates. Place the flower template in the top left hand corner of the frame and use transfer paper to trace the design onto the paper. Place the leaf at a jaunty angle and trace around the outside. Repeat until you have enough leaves drawn to cover your frame. 3. Align the glass from the clip frame over the sketch design. You can secure into position with low tack tape if you wish. TIP Make sure that the glass is grease and dirt free before you paint. 4. Using the relief outliner as you would a pen, trace the flower and leaf outlines as well as the central frame edge onto the glass. TIP Place the nozzle of the tube into position on the glass. Apply an even, gentle pressure to the tube until the outliner comes out of the nozzle. Maintaining the pressure, lift the nozzle away from the glass and drag the outliner along the design. Touch the nozzle down onto the glass at the end of the line. This will help to produce an even line. Make sure that all of the lines are joined and solid - this will prevent the glass paints from 'bleeding' into unwanted areas of the design. 5. Once the outliner has dried, fill in the design with aqua-glass paints. TIP Apply a generous amount of paint to create a jewel like effect. 6. Whilst the paint is still wet, add a line of green bugle beads to the centre of each of the leaves. Drop in one red bugle bead to the centre of each flower petal. Using tweezers will help you to place the beads accurately. Add a pearl white nugget to the flower centre. Leave the frame to dry flat.